The third installment in my “Interesting Facts…” series comes from the country of Honduras. While I didn’t get to spend a lot of time in Honduras this past summer, I definitely enjoyed myself during my stay and would love to go back one day. So, without any further ado, here are 7 interesting facts about the country of Honduras. 5. 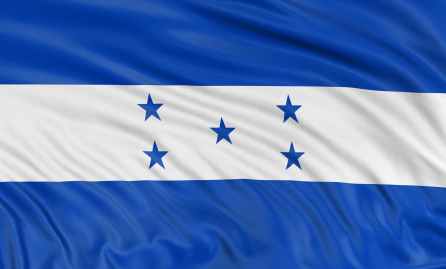 The Honduran flag has 3 equal stripes. The middle stripe is white and has five blue stars on it. These five stars represent the five states of the Central American Union (which I talk more about here on #7) and the middle star represents Honduras, with is geographic location in the middle of the five states. 7. Honduras is roughly 112,000 square kilometers, making it the 102nd (out of 251) largest country in the world according to the CIA Factbook. It is ranked between Benin (101) and Liberia (103). Cool, interesting facts, I would love to visit sometime! Thanks for sharing. I never knew Belize was formerly know as British Honduras. Great fact! It’s always good to know facts about a country. I’ll go visit Honduras when I’m back in Miami at the end of this year. It’s so close from there. I highly recommend it! And if you make it to Honduras, you’d be crazy not to head across the border to Guatemala as well! I’ve really appreciated your “interesting facts” series. It’s a nice way to learn some key aspects of places that I haven’t been or had much information about before. I like the flag pic and description, too. I’ve always found country flags to be totally cool for some reason. Yea I’m excited for future posts in the series! Glad you found this stuff interesting! I knew all of those facts exept 6 and 7. I also went to Honduras andm one time me and my family went scuba diving and we all saw some jelly fish and my sister freaked out and people were all watching thinking she was attacked by a shark.